When you hear the words ‘visa’, it’s not a nice reaction, is it? It’s the kind of reaction you have when, let’s say, you have to ring your internet provider or your bank, when you have to take your car in for an MOT - it’s just annoying and inconvenient and wholeheartedly boring…but nonetheless, entirely necessary. Applying for a holiday or tourist visa whilst you’re back in your home country can be a little stressful, depending on the situation however applying for a visa extension whilst in that same country adds another little ‘oh my good lord I could actually end up being deported’ stress just you know, for good measure. Recently, I received my visa application decision regarding my request to extend my South African Visitors Visa (section 11(1)) and despite sitting here now, happy and content in the knowledge I’ve been allowed to legally stay, the actual application process itself was…a lot and not quite so plain sailing for the old noggin as I now so rosily remember. I am a UK citizen therefore the South Africa visa laws allow me a free 90 day tourist visa. The amount of days your visa allows depends on the country you are from therefore check on the government website for your own allowance. To extend your South African tourist visa, you can ONLY apply through vfsglobal.com - you cannot apply independently from this company. When you google information online, it can get pretty confusing as there are lots of forums where people have gone to apply at Home Affairs themselves and paid just R450/500 however this is outdated information and trust me, from personal experience, you cannot simply arrive at Home Affairs and apply - they have NOTHING to do with visa extensions any longer. The advice, which of course, my friend and I did not follow, is to apply within the first 30 days of arriving in the country because application processing times can take up to 10 weeks. With the excitement of Christmas, New Year and my friend’s family coming to visit, we ended up applying on our 29th day in the country…and could not get an appointment for another month - cue LOTS OF STRESSING. 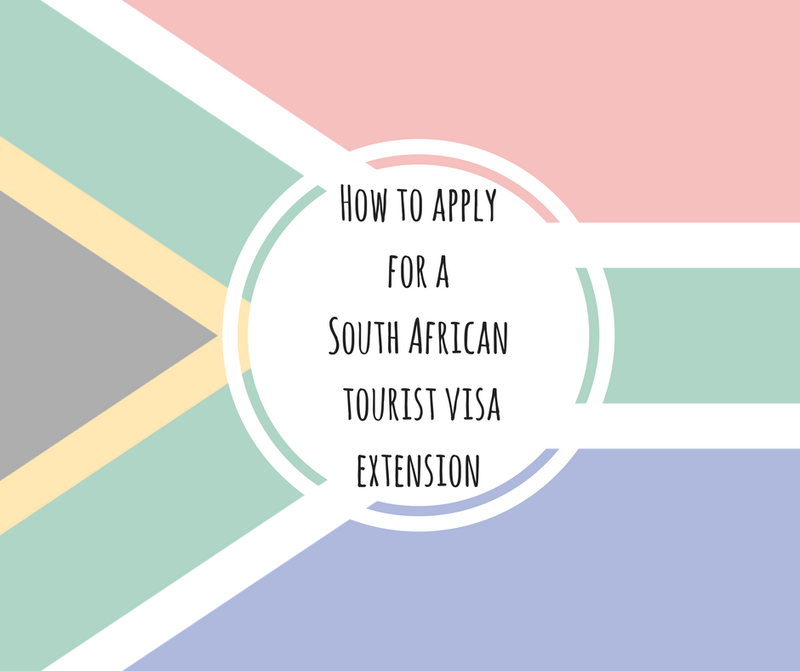 To apply for the extension, you must first create an account with vfsglobal.com, pay the VFS service fee of R1350 and the visa fee of R425 and then select a convenient appointment date and time. Once you’ve done this, you can sit back, relax and chill until the day before your appointment, right? We did this, and it created a whole lot of unnecessary stress on the day of our appointment and whilst there are so many horror stories about how awful the whole process is, with clear information and a degree of organisational skills, it would actually be perfectly fine and very easy to do by yourself. On the day of our appointment, we arrived with our passports, our letters detailing the reasons we wanted to stay, our bank statements and our proof of onward travel. Sound about right? Well..it wasn’t. Once we arrived, we were sent up to the VFS offices and were asked to produce our appointment letter…which we did not have, cue mad dash to the nearest internet cafe to print it off. We were then told on our return that, and I’m really not kidding here, we were at the wrong building so off we run to the ABSA Building in Cape Town. We get there, are allowed up and the centre is pretty much empty, so don’t worry about it being jam packed and there being no time for you to apply - once you’re actually at the application offices, it’s very well organised and chilled. SO! We did it - we managed to get to the right office, at the right time, with the right documents, right? Wrong. I mean, the lady humoured us and simply pointed to a computer and printer at the back of the room so…off we went again to produce another document which we had not managed to get prior to our appointment. (Yes, we hated ourselves at this point). After you have submitted these documents, you will be given a receipt which has your application tracking number on. This receipt is absolutely VITAL as this piece of paper proves you are allowed to stay in the country if you’re original visa runs out whilst your application is still being processed and believe me, this information is like gold dust. I rang, I googled, I prayed to the Gods of the world for an answer to the question ‘what happens if my visa runs out whilst my extension application is still being processed?’ and I here now, this daft blog written by someone who thinks she’s a lot funnier than she actually is, has the answer. IF YOUR VISA APPLICATION IS STILL BEING PROCESSED AND YOUR ORIGINAL VISA RUNS OUT, YOU ARE ALLOWED TO STAY IN THE COUNTRY UNTIL A DECISION HAS BEEN MADE. Worriers of the world, relax - there you go, now have a cup of Rooibos and chill out, I stressed so you don’t have too. To collect your visa, you simply need your passport and your receipt which you were handed when you applied and decisions can only be collected between 10am-3pm weekdays (I’m not sure about Saturdays however you cannot collect at any time on Sundays). You are advised to get there as early as possible therefore of course, myself and my friend got there at dinner time, seemingly the busiest part of the day. The collection process is very simple - you simply arrive and show your passport and receipt, are given a number, told to take a seat and simply wait until your number is called out. You sit down in a separate room with a person who opens your application in front of you to ensure no one has tampered with it, shown the decision and as mine was granted, the new visa dates are stuck into your passport. And, that’s it! You remain a legal tourist! Woo! No prison time for you! Of course, once your application has been accepted and everything has worked out, it all seems peachy and to be honest, compared to the scare stories people seem enthralled in describing in such minute detail, my experience with VFS Global in extending my tourist visa was absolutely fine. The only problem you face throughout this whole process is finding the correct and relevant information that you need. At one point, as we were trying to decide if there was any point in applying now we were going to have to wait a full month for an appointment, I rang the customer helpline 3 times with 2 questions and received…3 different answers for both questions. This though, is the polar opposite service we received on the actual day of applying and when we collected our visas, with the staff helpful, friendly and surprisingly understanding for how ill organised we both were. I hope this was of at least some help to those of you out there who are wanting to apply for a tourist visa extension - it can be stressful at times and a lot less exciting than seeing the sights of this beautiful country of South Africa but in the long run, it really couldn't be more worth it. Good luck with your applications and feel free to ask any questions you may have about the process in the comments or over on my social media. Thanks for taking the time to write this up. It was really useful for me to get an idea of what I'll be in for. A question: am I correct in understanding that one can apply as soon as they want for the extension? For example, even just the week or two after they arrive in South Africa? Hi Megan, sorry for the late reply! I would recommend you make the appointment with VFS to apply for your extension as soon as you can once you get there. Your appointment date will most likely be 2-3 weeks after the day you book so learn from my mistake (of booking the appointment on the last week within the 30 days you're allowed to apply) and save yourself the stress. Hope it all goes smoothly for you! Hi Charlotte. I'm just wondering how close to the expiry of your original 90 day visa you applied for the extension / had the meeting with VFS? Did they issue you the correct extension so you got 90 days applied from the expiration date of the original visa? I have read online that people who have applied within the stated 30 days have only had their visas extended from their dates of application, and hence only really got, say 120 days in SA. I'm trying to get my full 180 days, so any info would really help me with this. Nice post, thank you for sharing it with us.